Athlete is one of our new varieties this year. Although previously available in supermarkets during the 2012 Olympic Games, Athlete has only recently been released to gardeners. Enjoy high yields of pale yellow tubers which won’t disintegrate on boiling and maintain their superb taste whether eaten hot or cold. Our other new varieties this year include Colleen, a good all-rounder first early, and Divaa, which is a second early with brilliant white skin. 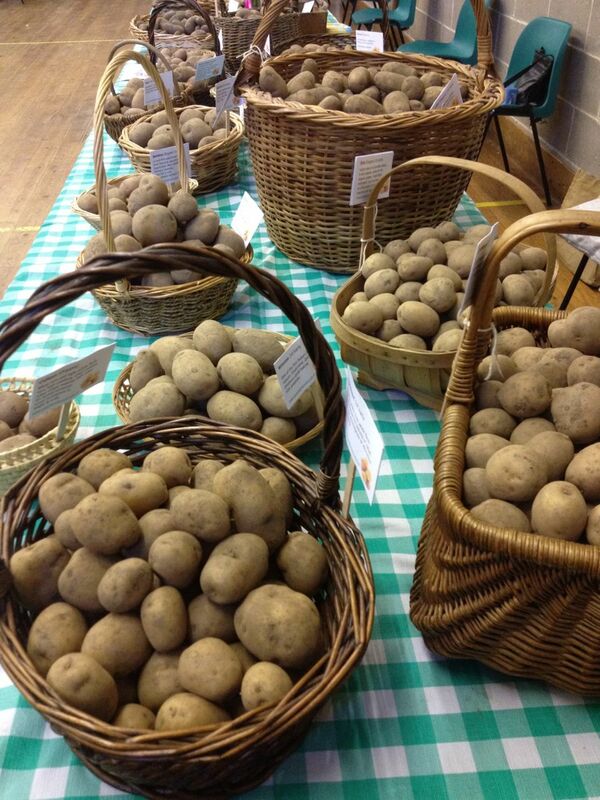 Sarpo potatoes are grown by the Sarvari Research Trust in North Wales. These potatoes all have excellent resistance to blight, so they are ideal for organic growers. Our participants have had great success with them. This year we have Sarpo Kifli, Sarpo Mira and Sarpo Una on offer. Ideal if you want a reliable crop. The Sarpo Mira is organic – it’s one of thirteen different organic varieties that we’re offering this year. Jazzy is popular with our local growers. This exciting second early variety has been awarded an RHS Award of Garden Merit for its superb garden performance. It’s a waxy, set-skinnned potato which is both versatile and good looking – boil, steam, crush or roast. Described as a “small potato that packs a big punch” because it’s full of flavour and has performed well in trials. Pink Gypsy was new to us last year and proved very popular. It’s quite distinctive looking, with deep pink and cream skins. The tasty white and creamy flesh has a lovely, fluffy texture when cooked. Great whether baked, roasted or mashed. If striking-coloured spuds are your thing, you might also like to try Apache (which has similar markings), Salad Blue, Shetland Black or Highland Burgundy Red. 1st Earlies: Casablanca (organic), Colleen (organic), Lady Christl, Pentland Javelin, Red Duke of York, Rocket, Sharpe’s Express, Winston. 2nd Earlies: British Queen, Charlotte (organic), Divaa, Jazzy, Kestrel, Maris Peer (organic), Nicola (organic), Sarpo Una. Mains: Ambo (organic), Apache, Cara (organic), Desiree (organic), Highland Burgundy Red (organic), International Kidney, Pink Gypsy (organic), Pink Fir Apple, Rooster, Salad Blue (organic), Sarpo Kifli, Sarpo Mira (organic), Shetland Black. Our full 2018 guide will be available nearer the time. Sorry, our advance orders are closed now – but you can still choose from 30 different varieties at our Potato Day on 3rd March 2018. We’re offering our popular gift boxes again this year. Each box contains two 8oz jars of homegrown preserves – you can choose the contents from our selection of jams, jellies and pickles. Look out for more Autumn preserves as we make them. They are boxed with a pretty fabric ribbon and tag (designs may vary). Jelly – Redcurrant*, Blackcurrant, Bramble. Our gift boxes are fully recyclable. The box, tag, labels and stickers are made of paper and card. Our ribbons are fabric, which can be composted or reused. Glass jars can be taken to bottle banks or recycling centres – or you’re welcome to return the jars to us at any Growing Newsome event. Our gift bags contain two 1lb jars of some of our most popular preserves. Choose any two of: Blackberry and Apple Jam, Plum Jam*, Blackcurrant Jelly, Rhubarb and Ginger Jam, Orange Marmalade. The sturdy paper bags have windows, a pretty fabric ribbon, a Christmas tag and a “Handmade with love” sticker. We also have a good selection of individual jars of preserves. Please ask for our latest information on 6oz, 12oz and 1lb jars. Our quince jelly (soft set) is £1.80 for a 6oz jar.